Comprising everything needed to begin taking instant film photos, the icy mint FUJIFILM INSTAX Mini 70 Instant Film Camera with 20 Sheets of Film Kit from B&H pairs the sleek instant camera with a 20-sheets of INSTAX Mini instant film. Designed for the selfie enthusiast, the icy mint INSTAX Mini 70 from Fujifilm is a sleek camera characterized by a range of features for self-portraiture and sharing your instant credit card-sized prints. The camera's design incorporates a retractable two-element Fujinon 60mm f/12.7 lens that permits focusing as closely as 11.8" in macro mode. The optical real image viewfinder has a 0.37x magnification along with a target spot to aid with composition, and the front of the lens incorporates a small mirror to also benefit more accurate selfie compositions. This twin pack of FUJIFILM INSTAX Mini Instant Film contains 20 sheets of instant color film that is compatible for use with the INSTAX Mini series of cameras. This film features vivid color reproduction with natural skin tones when used under daylight (5500K) or electronic flash lighting conditions. A refined grain structure provides high image sharpness and clarity as well as a versatile ISO 800 film speed for use with a wide variety of subjects. Each sheet of film produces a 2.4 x 1.8" glossy image area that is surrounded by a simple white border. Quick, instant developing is possible when working in temperatures between 41-104°F. 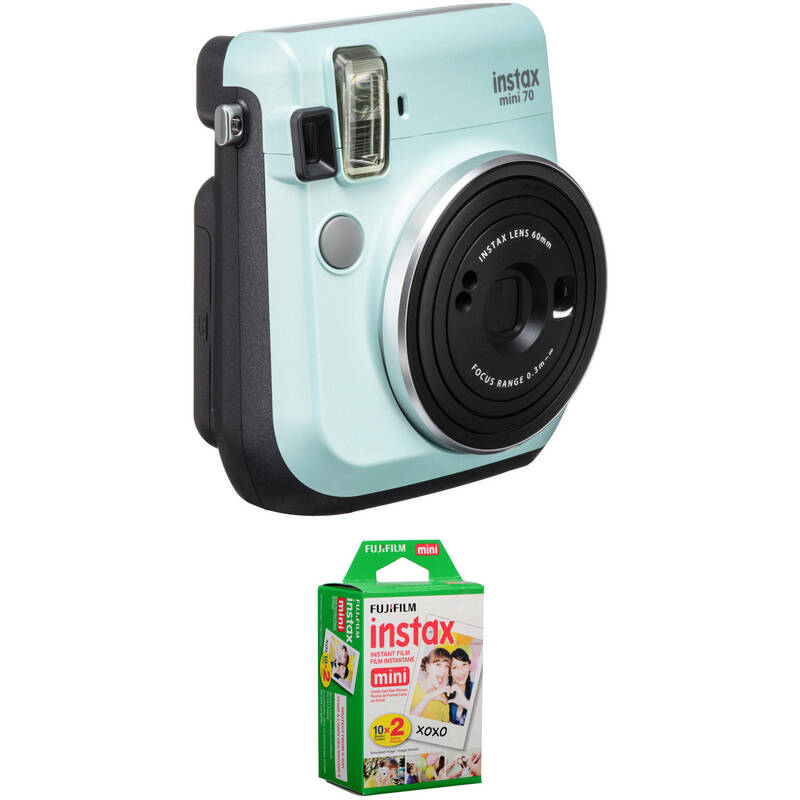 Box Dimensions (LxWxH) 6.75 x 4.5 x 3.25"
Box Dimensions (LxWxH) 3.9 x 2.6 x 1.7"
INSTAX Mini 70 Instant Film Camera (Icy Mint) is rated 5.0 out of 5 by 1. Rated 5 out of 5 by Mae Vera from Perfect I loved that this shipped fast. The quality of the photo was awesome with low light only. I highly recommend this.